A stunning view of Puget Sound and the Seattle skyline greets you upon arrival at our Rockaway Beach house. The ever changing view includes ferries, cargo ships and pleasure boat traffic, along with sea lions, porpoises, and bird life all set against the background of the Space Needle and the Seattle skyline. The open floor plan allows you to take in the views from almost anywhere in the house with most rooms having spectacular water views. You will also appreciate the tranquility and natural beauty of our south island location while being just 4.9 miles from the shops and restaurants of downtown Winslow, along with your own private beach. •	High speed wireless internet. •	Library area with a wide variety of hardcover books, games, and playing cards. Kitchen: You will enjoy cooking and the view from this well equipped kitchen. •	Coffee maker, coffee grinder, and electric tea kettle. Bedrooms (2): Enjoy waking up to dramatic sunrises and the sounds of the waves and sea gulls from the master bedroom. The master bedroom features a balcony overlooking the Puget Sound, king bed, LCD television with cable and ceiling fan. The loft bedroom features a queen sized bed. •	Cycling on the many lightly travelled roads of the island. Bikes available for rent from Classic Cycles in Winslow. •	Stretching your legs on one of the nearby forested hiking trails that are within easy walking distance. Maps and directions to nearby trails provided. •	Enjoying some local culture by visiting the Bainbridge Island Museum of Art or the Bainbridge Island Historical Museum. 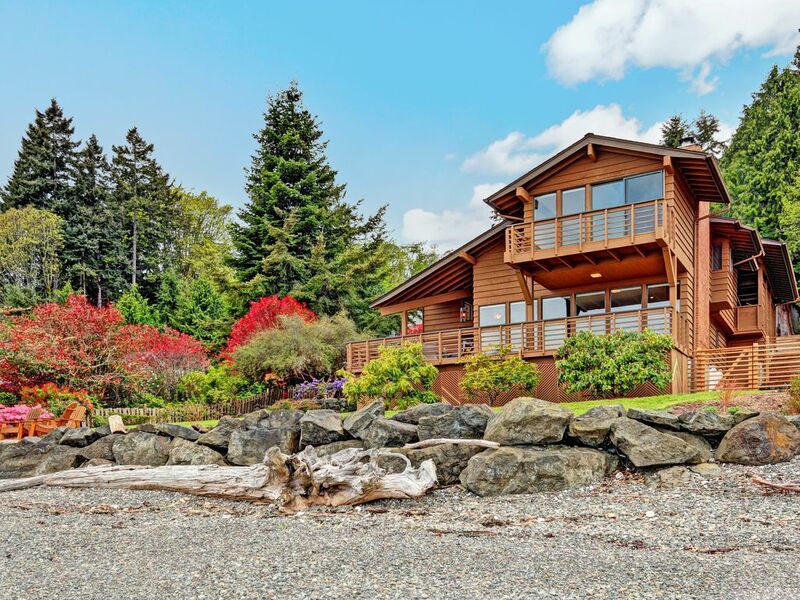 We have been fans of Bainbridge Island for a very long time and when the opportunity to acquire this home arose, we couldn't resist. We have spent over three decades managing award winning hotels and saw this house as a great chance to blend our professional experience with a love for the island. Both of us are avid cyclists, and kayakers which are some of the many outdoor activities that you can enjoy on Bainbridge. We hope you have the opportunity to stay with us and enjoy all that our location has to offer. We fell in love with this house because of the stunning view of Seattle and Puget Sound from every room in the house. The other advantages are its low traffic south island location, great cycling, kayaking, diving and wonderful light filled rooms. This is a great house for activities such as sipping coffee while watching the sun come up over Seattle and the cascades, sitting on the beach with a campfire or just walking the dog to Halls Hill Overlook. For those wanting more physical activities the south island location is convenient to cycling over to Lynnwood for a morning pastry, jumping on one of the hiking trails close by or kayaking to Blakely harbor. Stunning views of the Seattle skyline. No bank waterfront, steps away from Puget Sound. The Cascade mountains serve as a backdrop to the Seattle skyline. Stunning waterfront view of Seattle, the ferries, sailboats, power boats and huge cargo ships. New modern propane fireplace in the living area. The second floor fireplace is not operable. Kitchen with all new stainless steel appliances. A wide variety of hard cover and paperback books. Deck off of living area. 'South Bainbridge location is ideal for cyclists. The famous Hilly Chilly Ride route passes by our house. We had an amazing time staying at the Rockaway Beach house. We lucked out with incredible weather and had crystal blue skies the entire time we were there. The view is literally stunning. We enjoyed 2 big fires, the BBQ, and a great family gathering celebrating my mom's 75th birthday. We very much hope to return again! Amazing view and beautiful setting!!! Our family had the best weekend in this gorgeous setting. The house is super cozy and has a great layout. Kitchen has everything you need and is modern and updated. Nice beds, super soft pillows, beautiful fireplace, comfy seating in the open living room with a wall of windows looking at downtown Seattle!!! It’s specatacular. Who needs TV when you have a million dollar view. The property is very well maintained, beautiful landscaping, right on the sound. This property definitely delivers on all levels and the owners really thought about every detail to ensure you have an amazing stay. We will definitely be back! Home a few days and already missing this house and fall on Bainbridge Island! The location is perfect ... a short, but beautiful, drive to town (Winslow) ... quiet ... right on the water with spectacular views of not just the Seattle skyline but the mountains in the distance and the whole Sound/Bay. Really, we could have just sat on the deck or inside by the fire and stared at that view the whole time. The sunrises were amazing! And the house was equipped with anything we could have possibly needed. Very thoughtful in all aspects. We bought some fresh veggies and salmon from Pikes Place and cooked fabulous meals. When you stay you have to go to Halls's Hill Lookout just down the road. That was really special. The five stars are so warranted. Thank you Pat & Carla for sharing this wonderful home!! We will definitely be back!! From the master when the sun comes out in the morning and shines on the the water like diamonds. It is gorgeous! Our suggestion for eating out is Nola’s flower filled courtyard. Mike and I have stayed at a lot of beautiful VRBO’s but we will never forget Pat and Carla’s Rockaway Beach home as we saw how much effort they put into making their guests comfortable with the many blanket wraps, easy directions, but most impressive is it was the best stocked home of staples we’d ever seen! Perfect layout. Beautiful view. Close to town and easy access back by ferry to do a day trip in Seattle..we did a Mariners game. Well stocked. Enjoyed the fire pit. Hosts that were available and considerate of my family's needs. Thanks for building memories for us. Rockaway Beach Road is one of most sought after locations on the island because of its outstanding views and quiet south island location. The south end of the island is the quieter location and does not have the traffic of 305 to contend with. Credit Cards may be used for payment but will incur a 2.5% fee. Memorial Day Weekend, Labor Day Weekend, Thanksgiving Week and Christmas / New Years December 20-31st stays, require a four night minimum at a rate of $345 per night.